In line with the rise of nuclear energy, uranium has become a pivotal commodity. This is especially true for countries that are highly dependent on nuclear energy to fulfill their domestic energy needs. Global uranium production stood at some 59.5 thousand metric tons in 2017. With a production of approximately 23.4 thousand metric tons, Kazakhstan is the largest single producer of uranium in the world. Other top producers include Canada, Australia, and Namibia. The world’s largest uranium producing mine is Cigar Lake in Canada. Some 6,924 metric tons of uranium were generated there in 2017. The second-largest mine is McArthur River, also in Canada, with nearly 6,200 metric tons of uranium produced in 2017. Approximately 50 percent of the uranium worldwide is produced by the mining method of in-situ leaching. Kazakh state-owned KazAtomProm is the world’s leading uranium company, having produced about 12,500 metric tons in 2017. Canadian Cameco and French Orano follow closely behind. In the same year, only 13 companies accounted for 93 percent of the total global mine production of uranium. 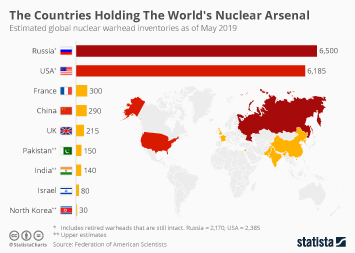 The leading consumers of uranium worldwide are the countries with the highest share of nuclear energy: the United States, France, and Russia. The U.S. used nearly 18,200 metric tons of uranium in 2016. That was nearly twice as much as France, which ranked second. Although there are global tendencies towards alternative energies, projections for nuclear energy consumption show a distinct increase until 2035. That means that uranium will continue to be an important commodity for decades to come.